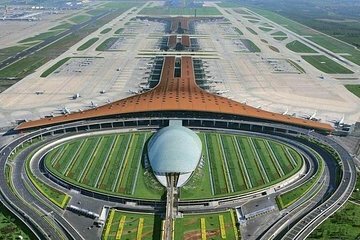 Organice su traslado de ida y vuelta al aeropuerto con anticipación y evite la molestia de reservar un servicio en Beijing. Esta forma conveniente de transporte lo lleva desde el Aeropuerto Internacional de Pekín a su hotel o residencia privada, y luego de vuelta. Significa que pasas más tiempo disfrutando tu viaje y menos tiempo desconcertando la logística. Servicio de traslado privado de ida y vuelta en Beijing. Reserve con anticipación para su tranquilidad que su logística está organizada. Viaje en vehículo confortable, climatizado. It was really easy to book and find our driver at the Beijing airport. We came out of customs and he was there waiting for us with a sign with our name on it. He didn't speak English but had a translator device with him. He was also on time for our pickup at the hotel and we arrived at the airport for our flight with plenty of time to spare. I highly recommend booking this in advance. Extremely easy. Had our names on a card and was waiting for us. Prompt on departure as well. Very clean car and just perfect. On time airport pickup/hotel delivery, on time hotel pick up/ airport delivery. Great experience. The driver was waiting for us after we got our luggage. He drove straight to hotel. He offered cold bottled water. The vehicle was immaculate and comfortable. The driver on the way back took us all the way inside straight to the ticket counter. Impeccable service! Highly recommended. Skip taxis! After landing, getting our luggage and clearing customs it was wonderful to find a driver holding a sign with our names on it! He took our luggage from us and led us to the clean warm car it was 5 degrees. Although he spoke no English he communicated via text from his office to confirm our pickup time for the return trip to the airport. He was on time for our return to the airport and upon arrival he took our luggage leading us to our check-in location. This gentleman saved us all the trouble of finding where to go in a strange airport. We felt he went above and beyond what we had contracted for and appreciated his efforts! Driver for pick up was over 20 minutes late. We had hailed a cab by the time he showed up. It was nice to have the driver there waiting at the airport when you get off the plane.. so maybe arrange that half. The taxi ride back to the airport is FAR less than this price and at least you can get a cab to show up when you need it. Totally disgusted with this experience. On time both ways. At the right price. Friendly driver and he quickly got us where we needed to go.